Well, I missed a major Flickr opportunity this weekend when I took the Bakfiets to the shop to get the gearing looked at. On colder days, we've been having some problems shifting so the kind folks at Devil's Gear said they would check it out. Sticking with my vow to try and never drive to the bike shop, P and I brainstormed how to get to and from the shop on two wheels. 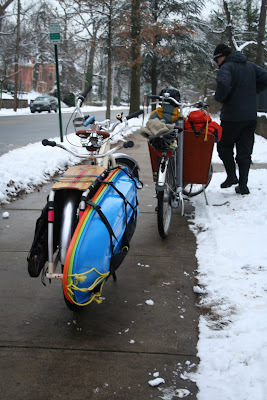 On Sunday morning, we put P's Rudge Roadster in the Bakfiet's cargo box (half in, half hanging out) and off I pedaled. I must admit that we should have gotten the bungee cords out because after one sharpish right turn, I clipped the Roadster's front wheel that was precariously close to the Baks's front wheel and suddenly I dumped P's bike out, right there on the street. Thankfully, there were not many folks out on the roads at that time so I didn't cause an accident or do any damage to the Roadster. I tried to resettle his bike in the cargo box, moving the wheel away from my front wheel. However, a few blocks up ahead, I managed to dump P's bike again-- Whoops! Without bungee cords, I decided to get MacGyverish (something P is far better at than I) and wrapped his locking cable around part of the Roadster's frame and grabbing on the other side with my mittened right hand. I managed to ride--slowly-- that way, clutching the cable like the bridle of a runaway house, the rest of the way to the shop. I couldn't decide if I was totally pleased with myself for pulling this off or simply chagrined for being such a nut. It did feel good that after leaving the Baks in Mitch's capable hands, I climbed on P's Rudge and headed back home. Picking up the Baks the next day turned out to be an unexpected adventure as well. Two of my fellows decided to hang at home with their dad, but C happily strapped on his googles and helmet and grabbed his book. He loved having the box to himself so flipped up the seat and stretched out right on the box's 'floor.' I was happy to be able to shift smoothly between gears, and spent the first half of the ride chuckling to myself imagining the wheelies that shop owner pulled off when testing the Baks himself. When I reached our neighborhood, riding along a two-lane street I cycle on often, sirens burst out. I looked ahead and saw two police cars speeding across the yellow line of this not-so-wide two lane road. I hastily pulled over and up against the right curb, right at an intersection where drivers were trying to figure out the sirens' whereabouts. It suddenly became apparent that the police cruisers were in pursuit of a driver, who also speeded across the yellow lane and through a red light, narrowly missing a car right at the intersection where I was stopped. It all went down in a matter of moments, but I must admit that I was shaken. It was one of the first times since I have been out on my bike that I felt truly vulnerable, and I felt REALLY vulnerable there with my son sitting there-- exposed-- in the cargo box seemingly unaware, engrossed in his book (you got to know him). I rode home really slowly after that. Three more police cruisers, lights flashing and sirens blaring, passed us but without the same speed and lane crossing as the first two. I've been unable to find any information in the news about just what happened, but it was a scary moment. I imagine I well would have felt some level of discomfort if I had been sitting behind the wheel of our car, with a boy strapped in the back, witnessing an out-of-control car careening by us. I was grateful, though, when I reached our home's red gate and parked the Baks up along the fence. Sara went to Devil's Gear today & bought a Magic Carpet for the snapdeck of our Xtra (& wonder if anyone has any idea what that means & why we are excited about it). Not sure any of my Fb friends will understand this, but I know you will. It has been so wonderful to be back in the saddle after a week off the bike thanks to ice on the roads, no studded tires, and cold temperatures. In fact, last week marked the very first week of the entire school year that we did not cycle to school at all... and I missed it tremendously! While there is still snow on the ground, much of the ice on the roads has melted. Also, the temperatures were a bit more moderate the past few days (OK, friends in Canada and Chicago, I know you are cycling in much colder temps and I bow down to you for it). The boys were happy to gear up in their winter riding accessories. We continue to think we made a great investment buying winter Bern helmets for all the boys. Plus, after complaints of the cold wind making eyes tear, we found cheap ski googles for the fellas. After playing super spy agents inside the house, the boys were happy to test the googles outside. They worked great and no complaints, at least about cold faces, were registered. Bulky coats do make the snapdeck a bit more crowded and I got frustrated with the amount of sniping over space happening behind me while riding. Yes, I do think the words, "If you two don't stop bickering with one another, I will pull this bike over" did escape my lips. At least their bums are now well padded, too. Then we loaded up again so we could head out to lunch. We had to be a bit strategic about distributing the weight of the fellas and gear because we needed to head up a relatively steep hill to get to our sledding destination. 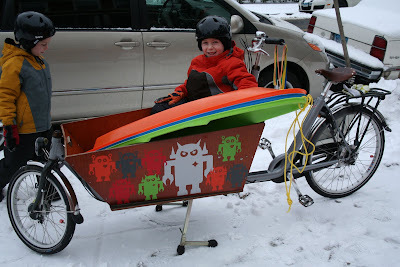 Hence, we put one boy and three sleds in the Bakfiets (less weight) and two guys on the snapdeck of the Xtra (more weight). P took on the challenge of riding the monster Baks up the hill and I rode the Xtra. I was prepared to get off and push the last bit of the hill if necessary, but I am delighted to report that both P and I managed to pedal the whole way there. 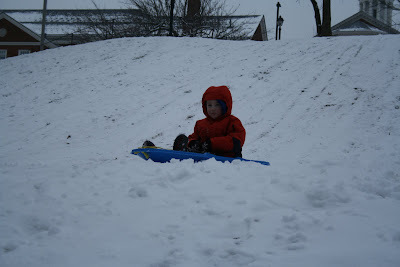 Of course, for the boys' first twelve sledding runs or so, we were still breathing heavily, recovering. 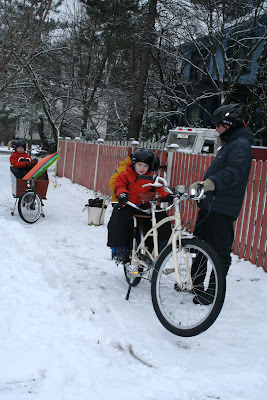 The boy-sled-bike configuration changed up at the end of two hours sledding. We had tired fellas who wanted to hang in the cargo box so the sleds got strapped to the Xtra, one guy climbed aboard, and off we cruised. Sledding alone would have been fun, but biking to sledding and then biking to lunch and home was that much more fun. 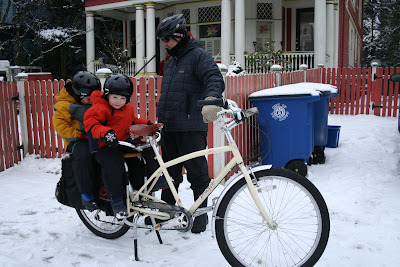 Read Totcycle's "Is Family Cycling Safe?" I have enjoyed catching up with the past posts from Julian from Totcycle. I was a bit bummed to hear that he was 'in our neighborhood' for a short moment over the winter break and I didn't get to meet this Seattle-dwelling fellow who writes an amazing family cycling blog and leads Kiddical Mass outings in his community. Plus, did I mention that he is hilarious? Also, he's a PEDIATRICIAN, as well. I put this all in capital letters because I will let this detail add some professional credibility to his latest blog post "Is Family Cycling Safe?". Please read it now. I will wait. Thanks for putting this all down, Julian. Thoughtful, thorough, & quite reflective of my husband's and my views. I hope you don't mind if I post a link to this blog post to my Facebook account & link it on my blog with big "this was written by a PEDIATRICIAN" intro :). When contemplating investing in the Bakfiets and taking the big plunge into family biking, I did have some worries. I had a few anxiety dreams before I actually got out on the road on a bike, particularly dealing with this one crazy intersection we must cross on our way to school. But once I was actually ON the bike and riding, many of my extreme worries went away and I felt so much safer and more comfortable cycling than anticipating cycling in my dreams. 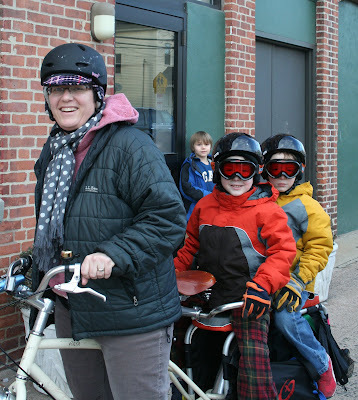 Whenever I ride with one or more of my children, I am always (hyper)aware that he/they is/are on the bike with me. I am an extreme traffic rules follower & even if I get fuming about something a driver does, I let it go (in ways I wouldn't likely if I were driving a car where I might speed up & express my displeasure). I always stop at red lights, I signal, I ride on the right unless I need to take the lane, etc. In the ten months that we have been doing this, we have only had two real incidents that scared me on the bike and I don't live in a town that is particularly bike friendly. I can't even count the number of times I was totally delighted out there on our bikes; there have been so many, a nearly everyday happening. I had a moment just this past week when we got my sons' fixed-up bikes back from our local shop. One of my guys was thrilled to hop on his bike and wanted to ride around our block. We live in an urban area, not super urban though, and in the past, I think one of us always accompanied him. He was staying on the sidewalk, not crossing any streets, and has had practice slowing down & voice signaling if he comes upon pedestrians (it was a quiet afternoon). So I said yes & off he went. And I hung out in front of our house & he lapped me again and again, calling out the number of times he did. I realized that this was the VERY FIRST time he had 'gone off' on his own and it felt... I'm not sure, sort of weird. When I was his age, I think I rode all over my suburban neighborhood by bike alone or with friends or my siblings. The truth was that I wasn't really worried about HIM; I was more worried what other folks who saw him riding alone on the far side of the block would think about ME and my parenting choice. 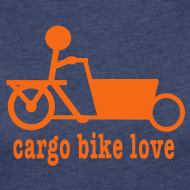 I don't, however, really worry about what others think of me cycling with my kids on our cargo bikes. I have gotten a few super passive aggressive comments from other parents who clearly disapprove of my choice, but we've gotten far more support for our family cycling. We were thoughtful in our decision to family cycle and we try to remain ever thoughtful and vigilant when we are out there on our bikes.